HEY YOU GUYS!!! Amazon's Blu-ray deal this week sets sail back to the 1980s in search of the treasure of One-Eyed Willie!! Amazon is selling 'The Goonies: 25th Anniversary Ultimate Collector's Edition' for $17.99 (50% off the suggested retail price). 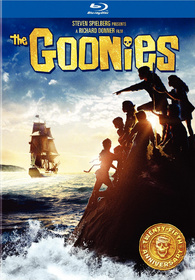 'The Goonies' stars Sean Astin ('The Lord of the Rings' trilogy), Josh Brolin ('Milk,' 'W,' 'No Country for Old Men,' upcoming 'Jonah Hex'), Corey Feldman ('The Lost Boys' franchise), Martha Plimpton ('200 Cigarettes'), Ke Huy-Quan ('Indiana Jones and the Temple of Doom') and Joe Pantoliano ('Cats and Dogs' franchise, 'The Matrix'). Overflowing with a treasure chest of premium items that celebrate this cherished film, 'The Goonies 25th Anniversary Collector’s Edition' includes an exciting new board game, collectible storyboard prints, a 1985 souvenir magazine with captivating behind-the-scenes stories about the actual filming in Astoria, Oregon, including the production design that transformed Astoria into the “Goon Docks,” and a reprint of a 2009 article with updates of the entire cast, as well as producer Steven Spielberg and director Richard Donner. Click here if this deal is "good enough" for you! This offer is available from now through September 17.